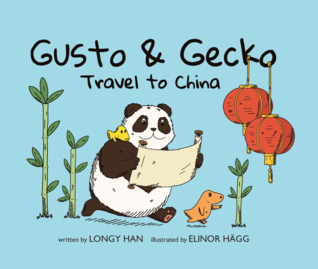 Gusto & Gecko Travel to China is a cute picture book which introduces young readers to some Chinese customs and tourist attractions. It is also a story about courage, friendship and collaborative teamwork. Gusto and Gecko are illustrated as two cute, cartoon style little reptiles. One Sunday afternoon they take off in their travel machine and it lands – “KABAM” – on the large and rumbling belly of Panda. Panda tells Gusto and Gecko about the upcoming “Zodiac Challenge” of the animals of China. The first 12 winners of the challenge will earn a place on the annual Zodiac calendar. Panda is reticent to participate because he fears he is “too big, too clumsy, too slow”. In fact, his character is illustrated as having a very rotund body which balances on two short, stubby legs – hardly the athletic type. Nonetheless Gusto and Gecko encourage him to join the challenge and offer to help. And so, the three characters travel to some famous sites in China and together compete in traditional Chinese activities. The story ends with an interesting twist as Panda finds a way to participate in the final and most difficult challenge and win a victory of sorts. The illustrations are bold and amusing, depicting animal characters standing on two legs and with cute, cartoon-style faces. Panda looks particularly lovable and a range of body postures and facial expressions illustrate his emotions – awkwardness, fear, bafflement, enjoyment. The illustrations come to a climax with a glittery, textured double spread page showing the Harbin ice sculptures being lit up. Some fairly complex ideas of cultural customs are portrayed in this picture book, making it probably better suited for 5-8 year olds than pre-schoolers. It would be an excellent resource for teaching this age group about Chinese New Year.